GetDataBack Simple portable is a completely redesigned and rewritten Data Recovery solution for Windows and Linux file systems. Our developers have combined decades of data recovery experience with the newest technologies. GetDataBack Simple’s clean interface guides you to your lost data in no time. You are literally one click away from your files. GetDataBack Simple is the data recovery software for the 99%. You can recover it now. No manual to read, no ostentatious options, no kidding. GetDataBack Simple combines recovery capabilities for NTFS, FAT, exFAT, and EXT. You do not need to find out beforehand which files system your drive was formatted with. GetDataBack Simple’s recovery engine internally uses four distinguished sophistication levels that automatically escalate until good results have been achieved. While we believe you don’t want to use anything else once you tried GetDataBack Simple, the price of $79 includes licenses for our classic GetDataBack software as well. Customers who bought GetDataBack for FAT or GetDataBack for NTFS in the past can use their existing license key for GetDataBack Simple. This is the lifetime update promise. GetDataBack Simple will recover your data if the hard drive’s partition table, boot record, FAT/MFT or root directory are lost or damaged, data was lost due to a virus attack, the drive was formatted or re-partitioned, a power failure has caused a system crash, files were lost due to a software failure, or files were accidentally deleted. 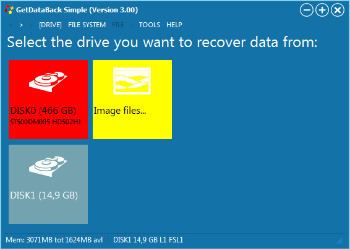 GetDataBack Simple can even recover your data when the drive is no longer recognized by Windows. GetDataBack Simple works on hard drives, SSD, flash card, USB sticks, etc. GetDataBack is read-only, meaning the program will not attempt to “fix” or write to the drive you are about to recover. Our flagship data recovery product now supports the Apple Mac APFS file system. APFS is the new file system rolled out by Apple beginning in 2017. GetDataBack Simple automatically recognizes the file system of the drive it scans. Version 5 now supports Windows NTFS, FAT12, FAT16, FAT32, exFAT, Linux EXT2, EXT3, and EXT4, and Mac HFS+ and APFS. NEW: Linux EXT, Windows exFAT, and Mac HFS+ are now supported as well.